Glaucoma specialist, epidemiologist, and ophthalmic therapeutics innovator, Dr. Murdoch is a lead innovator in beta therapy for glaucoma surgery and he led two large clinical trials demonstrating efficacy. 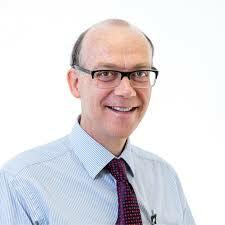 Dr. Murdoch is Consultant Ophthalmic Surgeon Moorfields Eye Hospital, and Senior Lecturer (Retired), University College London (UCL) Institute of Ophthalmology. Trained at Westminster Medical School. MD thesis in onchocerciasis and glaucoma, Northern Nigeria. MSc in epidemiology at London School of Hygiene and Tropical Medicine. Honorary Consultant Ophthalmologist Moorfields Eye Hospital and Honorary Senior Lecturer University College London. Clinical work in complex glaucoma. Research at Institute of Ophthalmology based around Vision 2020, glaucoma, telemedicine and public health both in UK and in Africa. Wide experience in qualitative and quantitative clinical studies. Working with West African College of Surgeons producing innovative training curriculum including sub-specialty skills for ophthalmologists.